iPass is a great service allowing free connection to pay wifi hotspots around the world. I can't do much about the first two, but I've written a widget to help with the last. Install the widget from here. 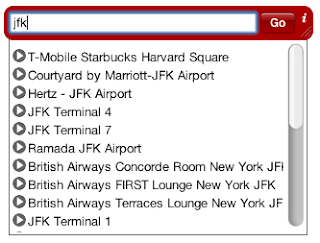 Enter a search into the text field and the widget will match locations and offer to connect to your pick of results. ...and you can search by things that are not visible in iPass directly, e.g. street name. Preferred country, city, area can be set on the back. I find it best to start the iPass client before using the widget. The widget uses applescript to select the result in the table, which also has problems, especially for selecting items in large lists which is ridiculously slow. Hence the Beta tag for this widget. This widget is not affiliated with iPass inc.